Finance and Mass Media Minister Mangala Samaraweera yesterday defended his earlier decision to appoint the retired navy official Rear Admiral Dr. Shemal Fernando as the new Director General of Sri Lanka Customs (SLC), noting that the decision was taken to discipline a group of people he called “port mafia”, at SLC. He admitted that he was forced to withdraw the decision and reappoint P.S.M. Charles for the position due to the SLC trade union actions, which otherwise could have created more complications. Addressing a press conference at the Finance Ministry, Samaraweera pointed out that SLC failed to meet the revenue target of Rs.1068 billion set for 2018 by Rs.147 billion, despite an 8.3 percent growth in imports, over 15 percent deprecation of the rupee during the last four months of 2018 and increased duties on vehicle imports. He noted that the revenue of SLC only saw a marginal increase of 1.4 percent year-on-year (YoY) to Rs.921 billion during last year, while the revenue from the custom import duty—the primary boarder tax— saw a decline of 28.5 percent YoY. He emphasised that a minimum of Rs.147 billion revenue was lost due to leakages, corruption and smuggling activities involving SLC. 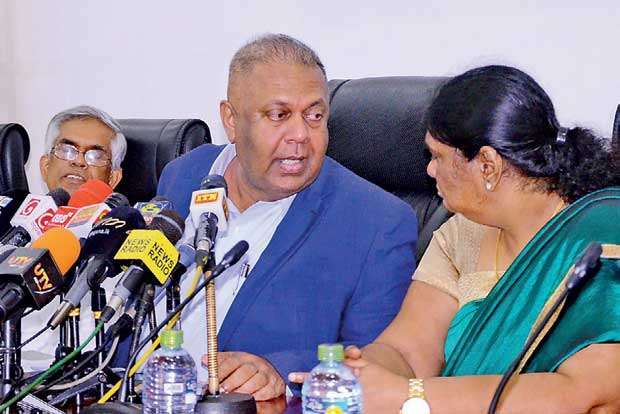 Samaraweera opined that SLC should be able to generate revenue of minimum Rs.1.5 trillion per annum, which would help to reduce the indirect taxes such as VAT. “The Custom is controlled by a mafia led by certain businesses in the country, with the support of some officials at SLC,” he said. He said he felt that it was too challenging for Charles to confront the port mafia, hence the proposal to appoint Rear Admiral Dr. Fernando was approved by the Cabinet to curtail this mafia. He revealed that following Fernando’s appointment to SLC, Charles was to be appointed to head a monitoring unit established at the Finance Ministry to oversee the activities of SLC and Excise and Inland Revenue Departments. “I felt that it was more challenging for the iron lady who confronted the LTTE in Batticaloa to face the port mafia as they were more dangerous. The decision was taken with the fullest support of the Cabinet of Ministers, including the president,” Samaraweera said. Speaking at the press conference, Charles said that she needed more time to complete the investigations on the fraudulent activities at SLC. “I have already submitted the preliminary investigation report to the minister. Within another two months, we can complete the full investigation. Because it’s the largest state department operating for a long time, I need a little more time to bring the necessary reforms to SLC,” she said. Samaraweera announced that once the full report is submitted, he would appoint a ministerial committee led by a former retired judge to take actions against the fraudulent activities taking place at SLC. He noted that Sri Lanka loses a significant amount of foreign exchange due to pepper and arecanut smuggling to India. “The smugglers earn millions per day by smuggling these goods to India through Indo-Sri Lanka Free Trade Agreement. Samaraweera said that smugglers are operating these activities hiding behind hub operations with the support of some SLC officials. According to him, these activities were given the green light through a decision made on April 12, 2012 by the then Cabinet headed by former President Mahinda Rajapaksa. Meanwhile, Charles noted that she’s waiting for the government approval to implement automation and paperless trade at SLC, where the system can eliminate almost all kinds of leakages, manipulation and fraudulent activities. However, amendments to the anarchic Custom Ordinance need to be made in order to implement these initiatives. Samaraweera said that the government plans to replace the Custom Ordinance, which was introduced in 1867, during the pre-Victorian era, with a new act within the next few months. (Colombo) REUTERS: Sri Lankan customs officers on Tuesday called off a strike that left 6,000 containers stranded at the country’s main port and put pressure on food prices, after the government agreed to reinstate their boss for three months. The strike has cost the government nearly Rs.20 billion in lost revenue, Finance Ministry officials said and any spike in food prices would be likely to accelerate inflation, which has held below 5 percent since September. Customs revenue fell by Rs.146 billion in 2018, missing its target by 13 percent, officials have said.